There was something important coming from the G20 meeting, but it is not the currency wars that have captured so many imaginations in the media and blogosphere. It was about corporate taxes, but before turning to it, let's try to put the currency statement in perspective. As many recognize, the currency market is prone to being used to pursue beggar-thy-neighbor policies of competitive devaluations. The danger is that it leads to trade wars and then shooting wars. The rules of engagement, as they have evolved over the last quarter of a century or so, are essentially three-fold. First, exchange rates are not proper goals of policy. Economic growth and price stability are the proper goals of policy. Second, foreign exchange prices are best set by the market in a flexible way to help foster the adjustment process and a reduction of global disequilibrium in terms of trade and capital flows. Third, while avoiding excess volatility, currency prices ought to reflect underlying economic fundamentals and avoid chronic exchange rate misalignments. On those rare occasions when action, is needed, it should be coordinated and not unilateral. The G20 statement, like the G7 statement earlier in the week, restated these longstanding principles. That members agree not to target exchange rates for competitive purposes was a pointed reminder to Japanese officials to refrain from talking about bilateral exchange rate targets. And indeed, over the past couple of weeks, Japanese officials have changed their rhetoric and have not talked about specific dollar-yen rates. Rarely in stories about currency wars has China been cited. Yet, it is an indicated co-conspirator, as it were. The G20 reference to moving more rapidly toward market determined exchange rates and the importance of avoiding persistent misalignments was clearly addressed to China, and some other East Asian and Middle East countries. The rules of engagement allow and encourage countries to pursue monetary and fiscal policies directed at domestic goals. For several years Japan has been encouraged to reflate its economy. That it appears to be doing so is not problem. No one in the G7 or the G20 have objected to that. The criticism levied against Japanese officials is when they try to manage the currency, suggesting certain targets, and/or overt attempts by the government to undermine what is seen as the independence of the central bank (which we have argued here and here it is not quite what it seems). It also means that the (unconventional) easing of monetary policy by the Federal Reserve is also not an act of (currency) war. Leaving aside the occasional comment by Brazil's finance minister and a rare comment by a Chinese official, few in positions of responsibility accuse the US of engaging in a competitive devaluation. The referees of the rules of engagement as it were, like the IMF, the G20 and the G7 generally agree that although the risks may be there, the conditions and practices now do not meet the threshold of competitive devaluations, a currency war or trade war. We expect the rhetoric in the traditional and social media about currency wars will die down in the coming period. The focus on currency wars distracts from other and arguably more important issues. Much of coverage of the G20 statement focused on the foreign exchange market, but has missed what is likely an even more important story. The G20 have begun a process that could lead to the largest overhaul of international corporate tax practices since the 1920s. The combination of the fiscal pressures at home and the increased importance of intellectual property (e.g., royalties, licensing fees) and questionable transfer pricing corporate practices has elicited a response. The official goal is to develop measures to stop tax arbitrage--the shifting of profits from home countries in order to pay lower taxes elsewhere. A recent OECD study found multinational companies were increasingly booking profits in different countries from where they were generated in order to avoid taxes. The role of intangibles, like intellectual property rights, services and brands have grown in importance but are difficult to value. International royalty and license fee payments paid to different subsidiaries within the same business group have soared. The growing volume of e-commerce also raises issues of the proper tax jurisdiction that are not handled well by the current tax rules. This comes even as OECD government have cut statutory corporate tax rates from an average of 32.6% in 2000 to 25.4% in 2011. The effective tax rate, which is what corporations actually pay, is often much lower due to assorted deductions and allowances. Recent reports showing that a number of large well-known global companies, such as Starbucks, Apple, Google, Amazon used complicated inter-company transaction to reduce their tax liabilities has helped spur official action. The big accounting firms are also being called out for the assistance they provide in helping businesses avoid taxes. Essentially, the OECD has called for, and the G20 appears to have signed off on, a new effort to modernize the international tax architecture, which could be ready in the next couple of years. 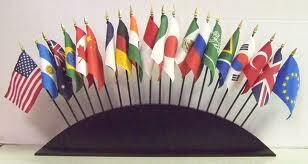 Three committees have been established and more from them will likely be heard around the July G20 meeting. The UK will head up a committee to look at transfer prices and the sales to subsidiaries to shift profits from high to low tax jurisdictions. It is illegal, for example, to structure a particular transaction for the purpose of skirting the law (it is sometimes referred to as "kiting"). For example, it is unlawful for one to withdraw $5000 twice instead of withdrawing $10,000 once in order to avoid reporting requirements. Can the same principle apply to businesses? Germany will head up a committee that investigates way in which companies have reduced the tax base in the accounting of income and assets. France and the US will lead the third committee, looking at e-commerce in particular, and the proper tax jurisdictions. The Obama Administration has been wrestling with the same issue. Once we get past the sequester and the continuing resolution (authorizes government spending even without a budget), look for corporate tax reform to become more salient. The fact that it will come after the other events, gives Obama some leverage with the business community, even when it came to the fiscal cliff. It is ironic that Obama, who has been accused of being a socialist, is on record of favoring corporate tax reform that include a cut in the top corporate rate to 28% from 35%. More important than the loopholes he wants to close to pay for the tax cut, is how overseas earnings should be taxed. Currently, the US taxes corporate profits earned abroad only when it is repatriated--brought back to the US. Last month, the nonpartisan Congressional Research Service reported that US-based companies are increasingly shifting profits to tax havens such as Bermuda and Switzerland. Senator Sanders (VT) has introduced legislation to end the current tax deferral and force companies to pay taxes on their foreign earnings. Some studies suggest that the higher levels of cash US corporations are holding is partly a function of these tax avoidance efforts. At the end of last year, Obama expressed some sympathy for some form of territorial system, which taxes domestic not foreign income. It could exempt offshore corporate profits from US taxes, seemingly shifting the stance of the 2012 election campaign. Currently, France, the Netherlands, Belgium and Hong Kong employ a territorial tax system. The currency wars have been over-hyped. There is less there than meets the eye. The rules of engagement allow for countries to use monetary and fiscal policy for domestic goals. It does not sanction foreign exchange targeting. The real news from the G20 meeting is the formal beginning of a process that could very well lead the largest substantial change in international corporate tax system in almost a century.